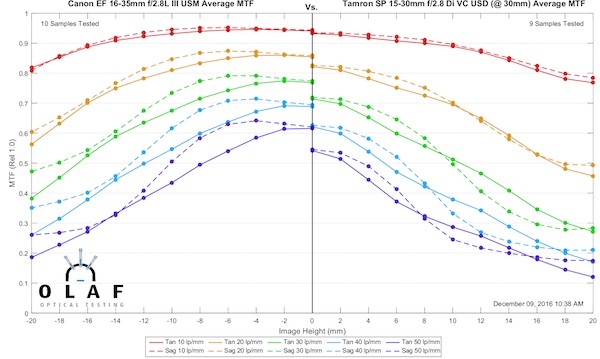 Contrary to what most people believe, we do pay some attention when people ask us to do MTF testing on certain lenses. I’m not saying we do it, but we do pay attention to the requests and when we have some downtime will look at that request lists and see if there’s something on it we can get to. One thing that a lot of people have asked about is how the third-party ultra-wide angle zooms look. Certainly, there’s reason for interest. The third-party alternatives cost far less than the newer brand-name ultra wide lenses. We’re going to put them out in one post, but really the three third-party ultra wide options aren’t all directly comparable to each other. 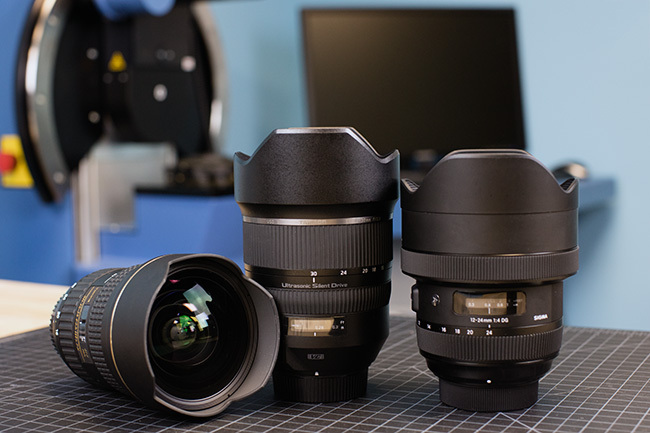 The new Sigma 12-24mm f/4 DG HSM Art lens is an alternative to the Canon 11-24mm f/4 L. The Tamron 15-30mm Di VC USD provides an alternative to the Canon 16-35mm f/2.8 L lenses and the Nikon 14-24mm f/2.8 ED AF-S. The Tokina AT-X 16-28mm f/2.8 Pro offers an even lower cost option. 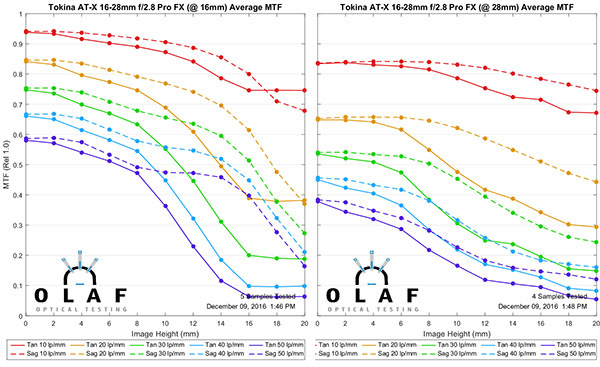 To be clear, MTF charts shouldn’t be the first consideration when choosing an ultra-wide zoom. Things like flare-resistance, vignetting, and whether you can easily use a filter on the lens may all be more important than absolute sharpness with an ultra-wide zoom. But sharpness is always nice to know about. Remember, as always, that all of the lenses were tested at the widest aperture. 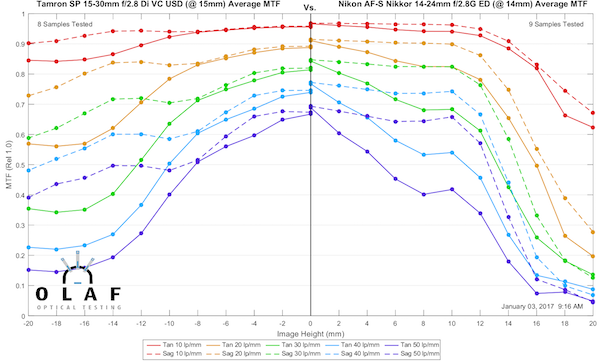 This means the f/4 lenses would be expected to be sharper than the f/2.8 lenses if all else was equal. If a f/2.8 lens is nearly as good as a f/4 lens on these tests, then you would expect it to be better once stopped down to f/4. To simplify things for those who want to tell me they want to see what the f/2.8 lenses look like at f/4, I’d be happy to. It costs around $4,000 to bench-test a set of 10 ultra-wides, so just let me know the check’s on the way, and we’ll get right on it. In the meantime, here are the results of the tests we have done. 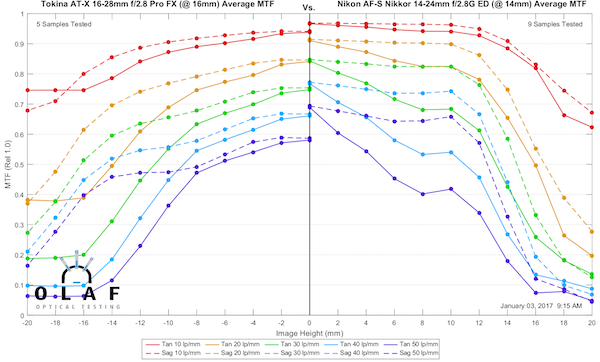 I’m going to start by just giving the MTF graphs for the three third-party ultra-wide zooms. Since these are 2X zooms, we tested them just at the two extremes. (OK, truth is ultra-wide lenses take foooorrreeeevver to test on the optical bench, our patience isn’t all that good, and we decided to use that 2X thing as an excuse not to do the center of the focus range too.) 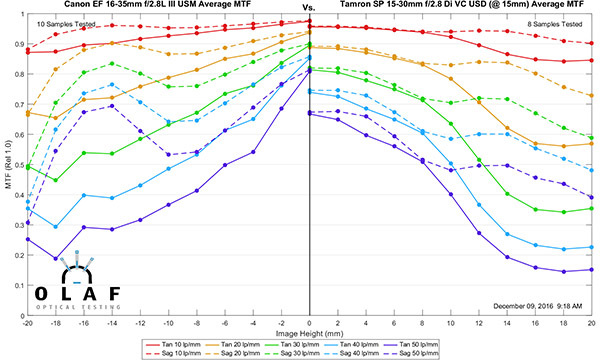 We’ll present the MTFs for each lens with the widest end on the left. That’s pretty good at both ends of the range, but most impressive at the wide end which is clearly sharper both on and off axis than the long end. Since most people are going to use an ultra-wide at the wider end, I think that’s a good choice. The Tamron also puts it’s best at the wide end, and it’s quite spectacular there. Remember this is at f/2.8 which should make a lower MTF, but it’s just about as good as the Sigma. 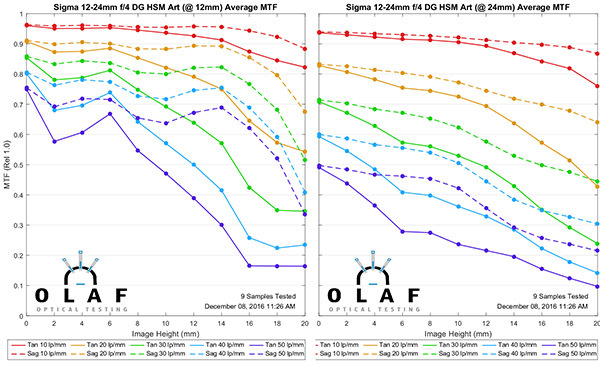 But also remember the Sigma is vastly wider, which is a tough thing to do. So far, though, I’m impressed with the third-party offerings. The Tokina is a bit older in design and by far the least expensive of the ultra-wide zooms. At the wide end, it’s not bad. Not as good as the Tamron, but acceptable. At the 28mm end, though, it’s really pretty weak. Still, it’s adequate at the wide end, and most people have the longer end covered by a 24-70 or similar alternative lens. Given the very low price of the Tokina, it would give a lot of individuals a practical ultra-wide option. 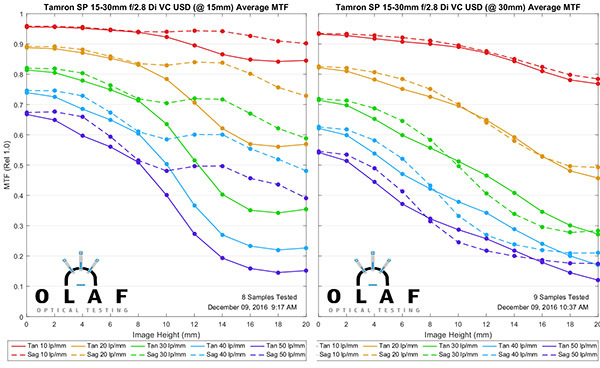 I thought it would be useful to do some graphs giving direct comparisons between the third-party wide zooms and a few of the brand-name lenses they would be alternatives for. We’ll compare at both the wide and long ends with the Canon on the left, Sigma on the right. 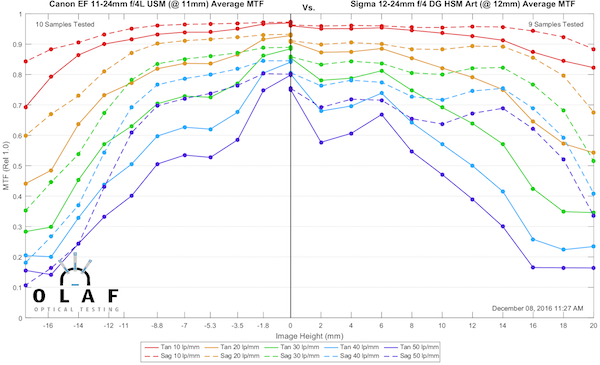 Remember the Canon is at 11mm while the Sigma is at 12mm in this graph. Here is the wide end of the range. The Canon is a tiny bit better than the Sigma, but this difference is small, and I doubt you’d see much difference in actual use. Copy-to-copy variation is greater than this difference in averages. And here they are at 24mm. 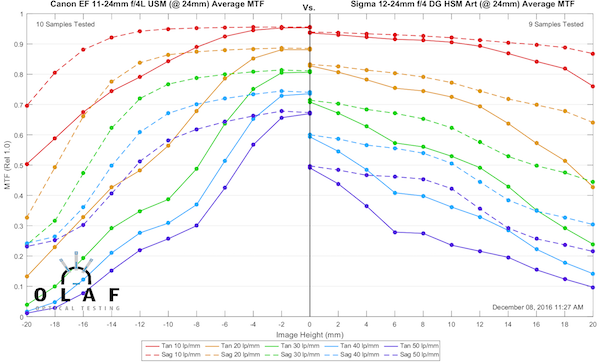 At 24mm the Canon has a clear advantage in MTF, one that would probably be noticeable, although the Sigma has lower astigmatism-like separation. The Canon would have a clear resolution advantage at 24mm. On the other hand, the Sigma has a $1,200 advantage at checkout. If I were buying the lens to use at the wide end mostly, the Sigma would have to be considered a very viable alternative. I suspect the comparison to the Canon Mk II lens is more pertinent and probably fairer. The Mk III is a brand-new release costing $2,300. The Mk II is still widely available new for around $1,450, while the Tamron is about $1,200. We’ll compare the Tamron to the Canon 16-35 Mk II first. Remember this is at the extreme of the zoom range, so in this first chart, we’re comparing the Canon at 16mm to the Tamron at 15mm. While the Canon has a little sharpness advantage right in the center, off-axis the Tamron looks much better with less astigmatism and higher resolution out near the edges. Now we’ll look at the long end, by comparing the Canon at 35mm to the Tamron at 30mm. The Tamron’s still a bit better, although things are more even now. 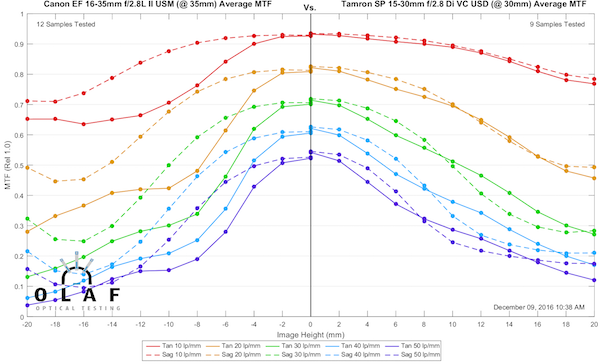 As I mentioned, there’s a lot more to choosing an ultra-wide zoom than MTF, but these curves would suggest the Tamron deserves strong consideration if you’re considering the Mk II Canon. OK, if you’re planning on buying a Mk III, then you probably aren’t considering third-party alternatives. That lens is a good example of sometimes things are expensive because they’re worth it. But I thought the Tamron’s performance was really good and for fun thought we’d post it up against the new wide-angle MTF champ and see how it looked. 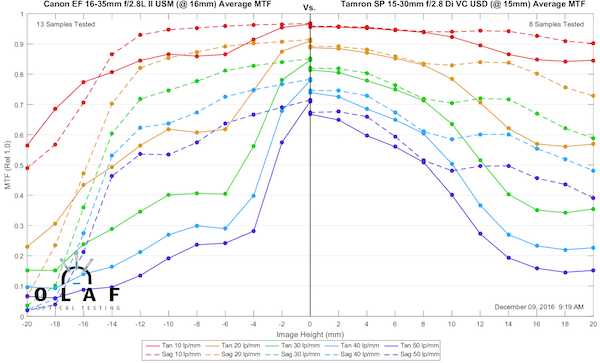 That’s a pretty credible performance for the Tamron. Sure, it’s not as good as the Canon Mk III, but it’s still pretty damn good for $1,000 lower sticker price. The Nikon 14-24mm f/2.8 has, until the Canon 16-35mm f/2.8 Mk III, been the gold standard of all wide-angle zooms. Lately, you’ve been able to find it refurbished or as gray market for only slightly more than the Tamron 15-30mm f/2.8, so I thought that comparison would be appropriate, too. Here is the Nikon at 14mm compared first against the Tamron at 15mm and the Tokina at 16mm. Remember, though, the difference between 14mm and 15mm is pretty noticeable. The Tokina is obviously not as sharp as the Nikon, but as we mentioned above, at the price they’re asking it’s definitely usable. The Tamron matches up pretty well, though. A tiny bit less sharp in the center but perhaps a bit sharper in the edges, although with more astigmatism / lateral color. From an optical point, the MTF tests agree with what people have said for some time. The Tamron 15-30mm f/2.8 is certainly competitive with the Canon and Nikon wide zoom lenses. It’s certainly worth consideration if you’re buying in this range. Of course, as I said earlier, there’s a lot to consider in a wide zoom that has nothing to do with MTF. If the shooting you’ll do makes Vibration Control useful, this is the lens for you. If you want to use screw on front filters, this isn’t. The Tokina is decent at the wide end, but not so much at 28mm. I’ll add that while I’m not putting up variance numbers with these, the Tokina’s were all over the place at 28mm. There was one copy that was every bit as good at 28mm as it was at 16mm. The majority were pretty poor, though. I say this because I’m sure some people have copies of this lens that are good at both ends. But I think they would be the exception. Still, given its price and the fact that most people use other lenses at 24mm and up, it’s certainly worth looking at, especially for those who only shoot wide occasionally. The Canon 1.8 lenses are definitely not a favorite of mine, but a good copy of the 70-200/2.8 L II IS USM is perfectly fine. The Canon 16-35/2.8 ver III is indeed a good lens but how would a Zeiss 15mm lens compare I wonder as it is in the same price range? Curious if you have ever looked at the Tokina 11-16mm at 16mm on FX.